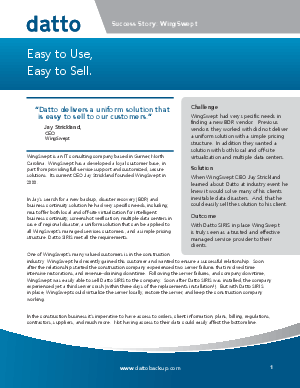 Read how a Datto Partner, WingSwept, uses and sells intelligent business continuity. Datto SIRIS met their extensive criteria for a robust backup and disaster recovery and IBC solution. WingSwept is confident using Datto they’re better positioned to ensure business continuity for their clients.